NEW HEIGHTS: Dancers Yvette Johnson, Alannah Pique, Meredith Cabaniss, Aly Romano, and Salinda Nichols perform. Every fall, UCSB Dance Company director Delila Moseley selects a small group of dedicated dance majors. And every spring, Moseley gets to sit back in the audience and watch her protégés, now experienced performers on the brink of launching their professional careers. This weekend, the 13 members of this year’s company present Trajectory, a mixed bill of dances including works by José Limón, the Mexican-American modern dance pioneer and creator of the deeply influential Limón technique; Donald McKayle, one of the first concert dance choreographers to address the African-American experience; and New York choreographer (and former Pilobolus member) Peter Pucci. The UCSB Dance Company is coming fresh off a tour of California, New York, and most recently Italy, where it spent two weeks and performed in six cities. In addition to the out-of-town appearances, the company participated in educational outreach programs at more than 14 Santa Barbara and Carpinteria elementary schools over the course of the past year. Their Center Stage appearance marks its triumphant season finale. The show’s title, Trajectory, could describe the growth of these 13 young dancers over the academic year. 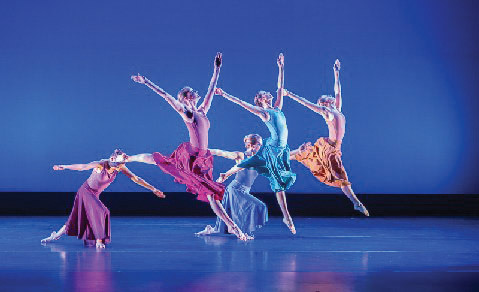 It could also represent the arc of American modern dance from the mid-20th century to the present. From Limón’s “Psalm” (1967) and McKayle’s “Shaker Life” (1972) through to Pucci’s “A Drowned Glimmer of Innocence” (2013), audiences will get a sense of the shifting terrain of themes American choreographers have negotiated over the past 50 years. Given that the program includes work by UCSB faculty members, Trajectory is also a chance to reflect on developments within the department. From Jerry Pearson’s “Strange Boat” (1999) up to Valerie Huston’s “Black Earth” and Nancy Colahan’s “Deep Currents,” both from 2012, and Christopher Pilafian’s “The Space Between Us,” completed just this year, this show provides something of a retrospective, as well as a picture of where dance at UCSB might be going next. Catch Trajectory on Wednesday, May 29, or Thursday, May 30, at 8 p.m. at Center Stage Theater (751 Paseo Nuevo). For tickets, call (805) 963-0408 or visit centerstagetheater.org. To learn more about the Department of Theater and Dance at UCSB, visit theaterdance.ucsb.edu.